I feel like I spend a lot of time typing the same phrases over and over again. For instance, when students send me an assignment via email, I send them back a ‘got it’ message. When I send them their graded assignment, I write a ‘your assignment is attached’ message. Isn’t there a keyboard shortcut that will do that for me? My preference in this blog goes to free programs and services, and this one technically is. However, if the program thinks you’re a business (by identifying certain business-like words) it will start to give you an annoying little popup prompting you to purchase it. The popups bugged me so much that I uninstalled it, but I missed the features so much, I re-installed it and sent the company the money. A decision I have not regretted. 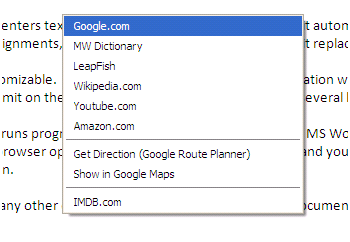 PhraseExpress works wherever you type text – in email, in Word, in Excel, in your browser’s search box. It automatically enters text. When I type #g followed by a space, it automatically replaces ‘#g’ with ‘Got it!,’ the message I send to my students when I receive their emailed assignments. When I send back their graded assignments, I just type #gr followed by a space and it replaces it with ‘Your graded assignment is attached! – Sue.’This is fully customizable. 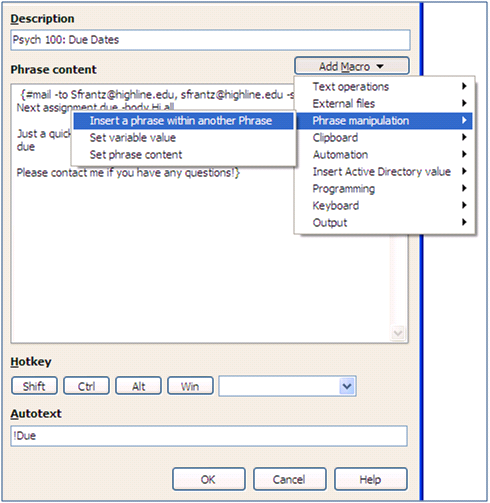 You can decide what keystroke combination will generate the phrase you want. For instance, I could choose $student followed by a ‘Tab’ to generate a phrase. There doesn’t appear to be a limit on the phrase size. You can use it to produce several lines with just a few keystrokes. It automatically runs programs. For me, #word automatically runs MS Word, #xl opens Excel, and #calc opens the calculator. Again, you choose the keystroke combination that you want. Perhaps you have your browser open and you want to open PowerPoint, and you designated #ppt as the magic keystroke combination. In your browser’s address bar, type #ppt and PowerPoint will automatically run. It automatically opens folders and files. With #md I open my “my documents” folder from anywhere I can type. I can also ask it to open a particular file — #grades opens my grade spreadsheet in Excel. It automatically does web searches. Highlighting any text anywhere and hitting CTRL-F8 generates this ‘search’ popup. If I select ‘Google.com’ then the highlighted text (buried under the popup) will be run in a Google search. The search services listed are customized; you pick what websites you want as options. 5. It automatically keeps a clipboard cache. Usually when you copy and paste, you can only paste the most recent copy. 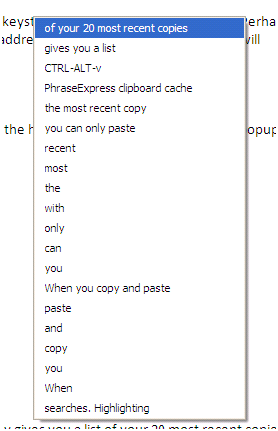 With the PhraseExpress clipboard cache, CTRL-ALT-v gives you a list of your 20 most recent copies. Just click the one you want. If 20 is too many for you, you can change the PhraseExpress settings to give you less. 6. It automatically opens a calendar. 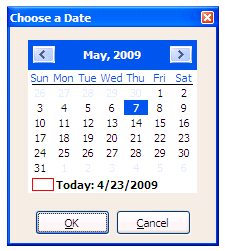 Select a date, and the date is entered as text. For instance, typing #cal gives me this popup. When I click on a date, the date is entered where I was typing. In the PhraseExpress settings, you determine the format for the date. I have mine set so that if I selected the date highlighted below, “5/7/2009” would be entered where I had typed #cal and the popup calendar would disappear. If I just wanted today’s date entered, #date would do that. For that matter, if I wanted to enter the current time, #time or #now would paste the current time. 7. It automatically opens websites. Let’s say I’m typing along in Word, like I’m doing now, and I wonder, “What’s new?” I can type cnn, and PhraseExpress will open the CNN website in my default web browser. 8. This is not a comprehensive list. Visit their website for more. With all of the examples above, you get a sense of what PhraseExpress can do. I want to give you one more example that’s a little fancier that really shows its power. Let’s say I wanted to send reminders out to my students about due dates for upcoming assignments. [Actually, this isn’t something I would do, but I can see where someone would.] 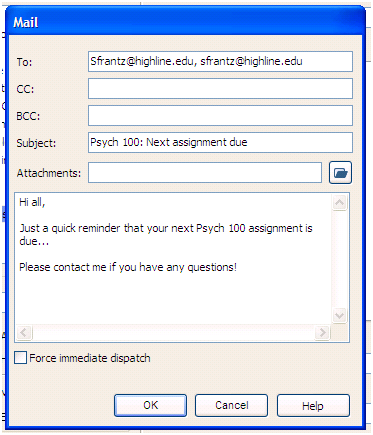 By typing !due PhraseExpress asks me to pick a date, and then it generates an email in Outlook with my students’ email addresses entered, with “Psych 100: Next assignment due” in the subject line, and some appropriate text and due date in the body of the message. All I have to do is hit ‘send.’ The next time I type !due, I can send the same message to the same students but have a different date. After clicking “OK” my shortcut has been saved and is ready for use! 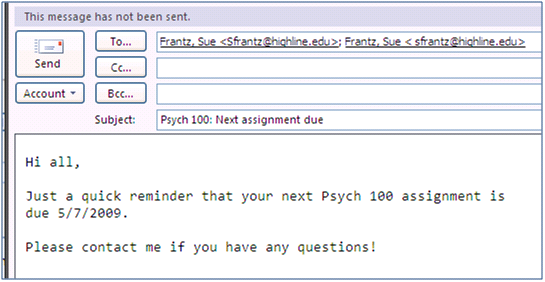 To recap, to send a due date reminder to my students, I type “!due” wherever I can type, click a date, and hit “send.” Done. Next term, all I have to do is delete my student email addresses and enter the new ones. As powerful as this program is, it’s not perfect. For instance, it works as a spellchecker, but its spellchecking isn’t as powerful as MS Word’s. It will tell me that I’ve misspelled ‘the’ when I type ‘teh,’ but I can misspell all sorts of words, and it doesn’t blink: spull, blunk, wirk. It has an ‘autotext’ feature that I turned off because it got on my nerves. When PhraseExpress detects that you’ve typed the same phrase repeatedly, it will offer you that phrase when you type the first few words of it. The problem for me was the few words it was picking up on were the first few words I used in a lot of phrases (so I discovered). What it would offer wasn’t usually what I wanted. For reasons I haven’t been able to discern, sometimes PhraseExpress just executes the command without asking if you that’s what you want to do. Generally, I’d prefer that it did it without asking, but I’d at least like to know why it sometimes asks and sometimes doesn’t. It may be that the program is just a little buggy. I don’t know. Having said that, what PhraseExpress gives me makes these issues very minor ones. Anything you do repeatedly on your computer (type phrases, open programs, open files or folders, do web searches), you can ask PhraseExpress to do for you. thank you for the excellent tutorial on PhraseExpress. I am impressed how sophisticated and smart you take advantage of the software. > It has an ‘autotext’ feature that I turned off because it got on my nerves. > but its spellchecking isn’t as powerful as MS Word’s. It just works different. MS Word underlines every word that is not contained in the dictionary. PhraseExpress, however, automatically replaces any of >10,000 misspellings it is aware of. It is like MS Word’s AutoCorrect (PhraseExpress can also import all you existing MS Word AutoCorrect items). You can customize the confirmation key but we would kindly advise you not to choose SPACE in particular. As you enter SPACE all the time it is not suitable as a confirmation key. Rather choose a key such as ; or # or any other key that can be easily reached but that you do not use too often within a word/sentence. > For reasons I haven’t been able to discern, sometimes PhraseExpress just executes the command without asking if you that’s what you want to do. We eagerly listen to our user’s feedback. Michael, thanks for the information! And to those who are considering using PhraseExpress, notice the prompt customer support — especially considering Michael’s comment came in at 7pm on a Friday night in Trier, Germany, the location of the company’s headquarters.